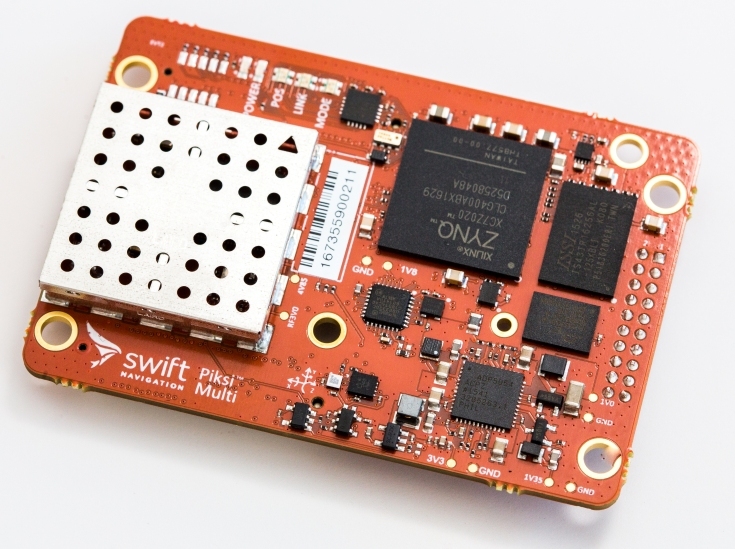 Swift Navigation™, the San Francisco-based startup building centimeter-accurate GPS technology, has announced its newest product, Piksi™ Multi, and the robotics industry is going to want to take notice of this multi-band, multi-constellation high-precision GNSS receiver. Just as Swift’s original Piksi module ushered in a new era of precision GPS affordability, the new Piksi Multi represents a revolution in robotics positioning with advanced precision GNSS capabilities for the mass market. Swift Navigation solutions utilize real-time kinematics (RTK) technology, providing location solutions that are 100 times more accurate than traditional GPS. The robotics market will benefit from Piksi Multi’s improved localization and control as well as fast initialization. The product was designed for high-volume integration, a cost-saver for robotics manufacturers. Autonomy begins with accuracy. Whether a robotic project requires automated navigation on land, in the water, in the air or space, Swift’s software-based approach and RTK solutions offer an optimal combination of centimeter-level accuracy, low cost and and easy integration. Applicable use cases include automated lawn mowers, highway landscaping, golf course and sport field maintenance, unmanned aquatic vehicles, routine process optimization, robotic delivery vehicles, construction vehicle monitoring and other robotic applications requiring vehicle heading and centimeter-accurate robotic systems control. Piksi Multi supports GPS L1/L2 and is hardware-ready for GLONASS G1/G2, BeiDou B1/B2, Galileo E1/E5b, QZSS L1/L2 and SBAS. Multiple signal bands enable convergence times measured in seconds, not minutes. Multiple satellite constellations enhance availability in various environments. Piksi Multi also enables customers to run Linux OS on its second core; allowing users to quickly prototype and adopt their own applications in a well-known and widely-used environment. In addition to the GNSS Module, Swift announced a new Piksi Multi Evaluation Kit — upgraded with all new components. The kit is intended to allow users to rapidly prototype and get an RTK solution up and running right out of the box. Swift’s new Evaluation Kit contains two Piksi Multi GNSS modules (for rover and base station), two integrator-friendly evaluation boards containing many I/O ports for testing, two GNSS survey-grade antennas, and two high-performance radios, delivering best-in-class reliability and range — well over 10 kilometers — and all of the cables and other accessories required for rapid prototyping and integration. The Piksi Multi GNSS Module is priced at $595 and the Evaluation Kit is priced at $1,995. For more information, visit Swift’s online store. Swift Navigation expects Piksi Multi to ship in early Q1-2017. The company is accepting pre-orders in its online store at www.swiftnav.com. Follow Swift on Twitter@Swiftnav.